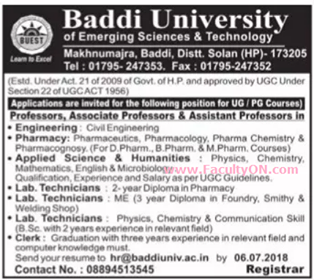 Baddi University, Solan has advertised in TRIBUNE newspaper for the recruitment of Professor plus Associate Professor plus Assistant Professor jobs vacancies. Interested and eligible job aspirants are requested to apply with in 6th July 2018. Check out further more details below. About College: The Society named Center for Advanced Studies in Engineering (CASE) was established on 2nd May, 2000 with a deep commitment to promote and propagate quality technical education. The commitment was translated into reality with the establishment of School of Engineering & Emerging Technologies (SEET) at Baddi in the year 2002. Baddi University of Emerging Sci. & Tech.